Almost two weeks into January and our whole family has spent the entire new year sick. No one has been able to escape these flu like symptoms and it's been quite exhausting, not at all the start to 2015 that we expected. What else are families for if not to share things? If your first week of the new year has seemed to come and go as unaccomplished as mine then I've got an easy way to help you redeem yourself. Amongst the goals I've had for this year, getting the house together, room by room has always been a long standing goal. 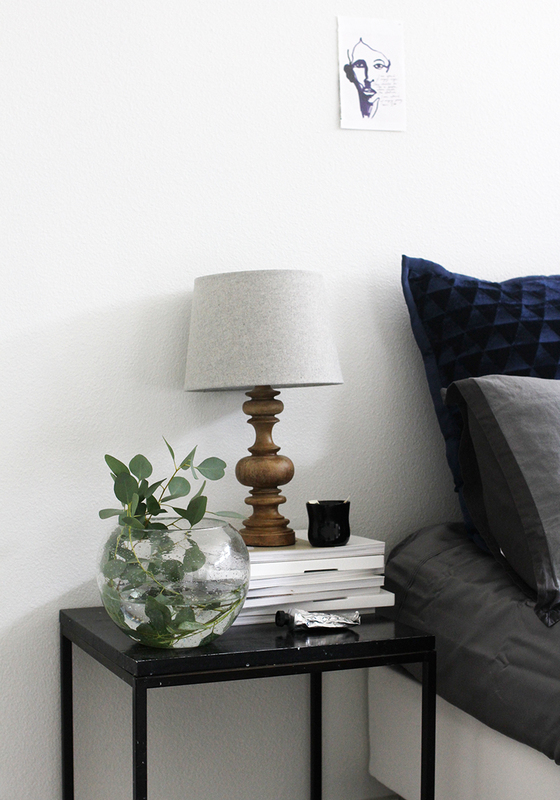 I've collaborated with Target to share with you an easy way to give your bedroom space a little makeover that will really only take a few minutes and a few simple items. 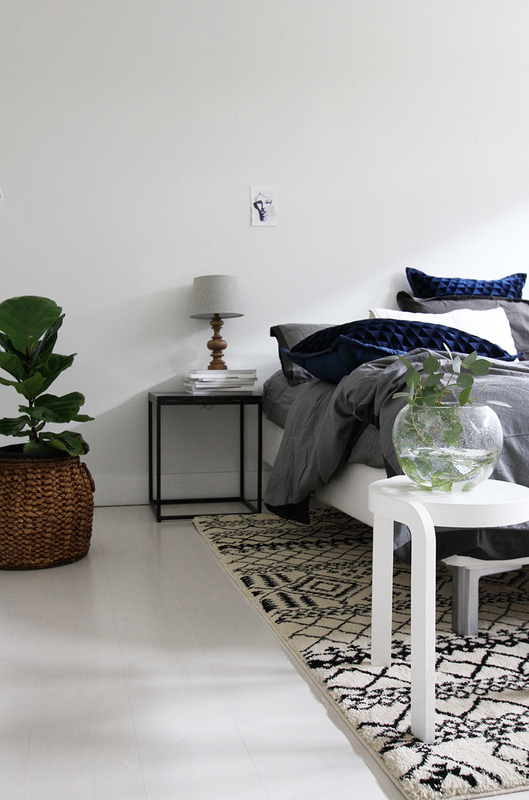 'Before' is the bedroom in it's most basic form with just a side table, white cover and small rug. 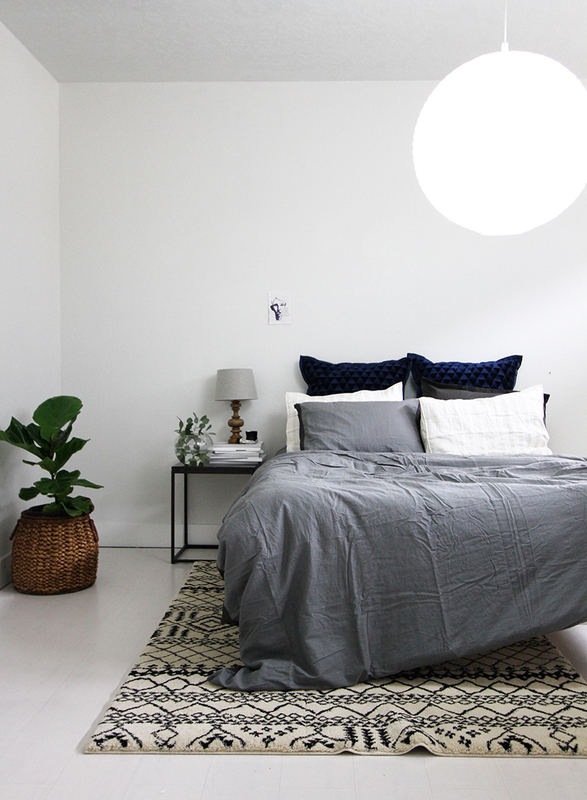 Swap the bedding for a charcoal linen duvet with dark grey sheets and the grey on grey looks really makes these deep blue velvet pillows pop a bit. I also used some quilted shams and a knit throw for added texture. 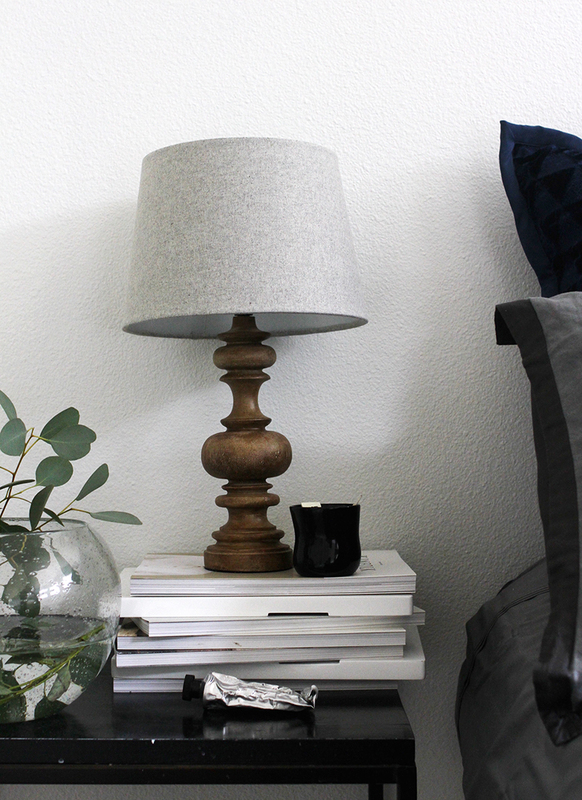 A grey wool lamp shade a top a wooden lamp whose shape balances out the cube side table and stacks of magazines. 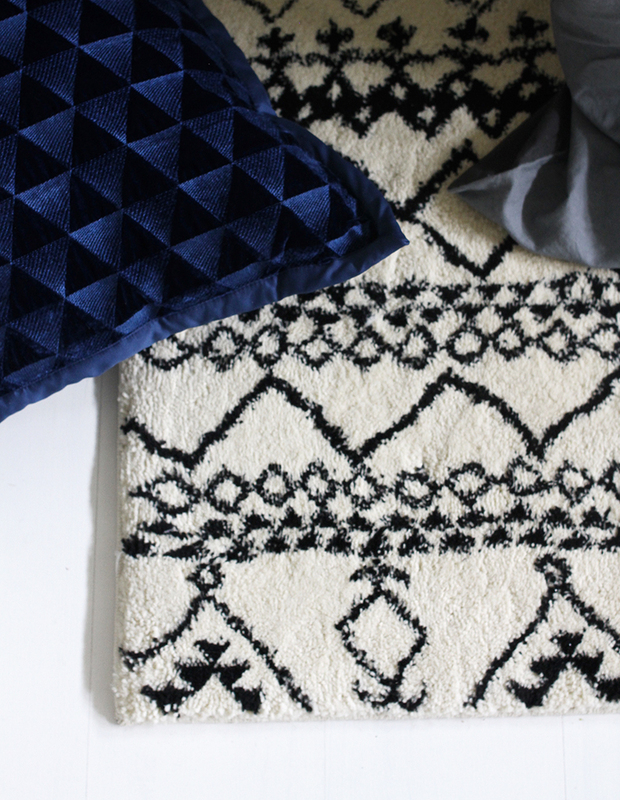 A patterned rug feels vintage and brings the black and white from the shams together without being too busy. I found this great round vase because I love fresh stems and a small fiddle leaf fig in a woven basket add a slight rustic edge. If you want to use patterns & multiple textures I suggest you repeat colors. It won't feel match but it will keep everything looking related and purposeful. 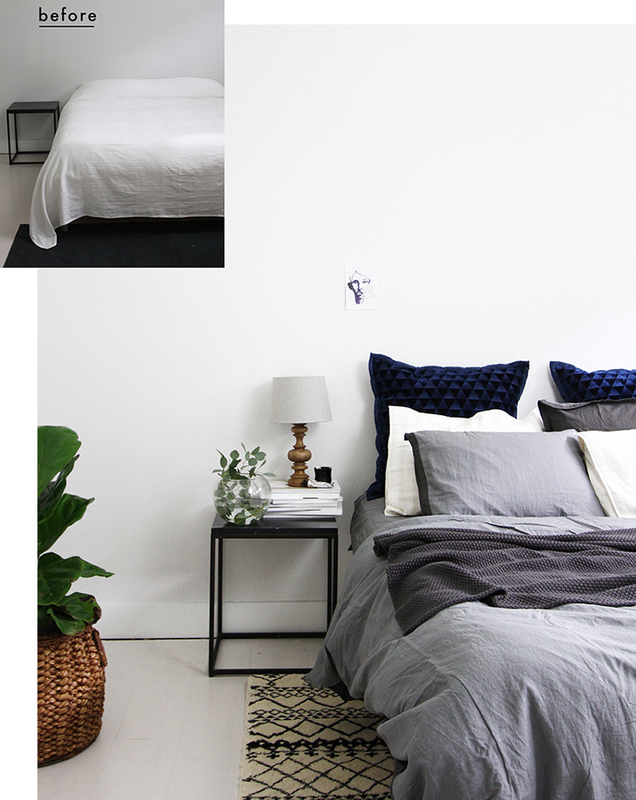 It doesn't take much, just a few key pieces with varying texture like wool, linen, glass or velvet creates a cozy a finished looking bedroom makeover. I would have painted the lamp white (or black as a matter of fact) but apart from that detail, I love it! The rug is from Target! I will add the link ASAP for you!